Who is the new first family? Who is America's first daughter? Ms Trump, like her husband Jared Kushner, is a special adviser to the president. Fox News described her as "a political novice like her dad", who had "glided past the more controversial interview topics like a seasoned vet". The Washington Post described it as a "largely friendly" interview, and noted that Ms Trump avoided answering two big questions about Mr Comey's evidence and the work of her husband, "masterfully pivoting from an unfavourable subject to a better one". 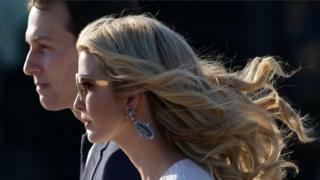 The New York Times also noted that she dodged questions as to whether Mr Kushner had quarrelled with other senior members of her father's team. Ivanka Trump: Who is America's first daughter?